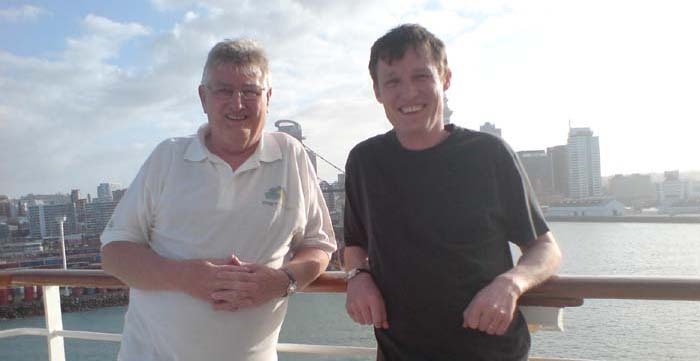 Me and my dad on board the Celebrity Millennium Cruise Liner leaving Auckland, New Zealand. Below are three links to the sketches that I produced onboard the Celebrity Cruise Liner 'Millennium' in November 2008 while on holiday with my dad. It was his 70th birthday year and someone had to carry his bags. It was a hard and dirty job but someone had to do it! The drawings were all produced live on the spot capture some of the wonderful entertainers onboard and a few scenes. Enjoy. Sketchbook Album: The slideshow but individually so you can choose single images. Large Sketches: Actual size images at 150dpi so good enough to print from.